KW has recognized the increase in level of participation and interest of Clubsport enthusiasts world-wide. Therefore, KW has decided to launch new product line - KW Clubsport. Based on Motorsport applications it targets the enthusiast looking for more aggressive setup for the racetrack with some mild road use. Enthusiasts have taken it upon them to build more track dedicated cars from their usually base of street going vehicles. Modifications consist of decreasing overall vehicle weight, increased horsepower and larger sized wheels and tires. Enthusiasts require a suspension setup capable of handling the increased forces that their vehicles demand. Clubsport has been released to fill that void as road setups are no longer ideal for this level of performance car. 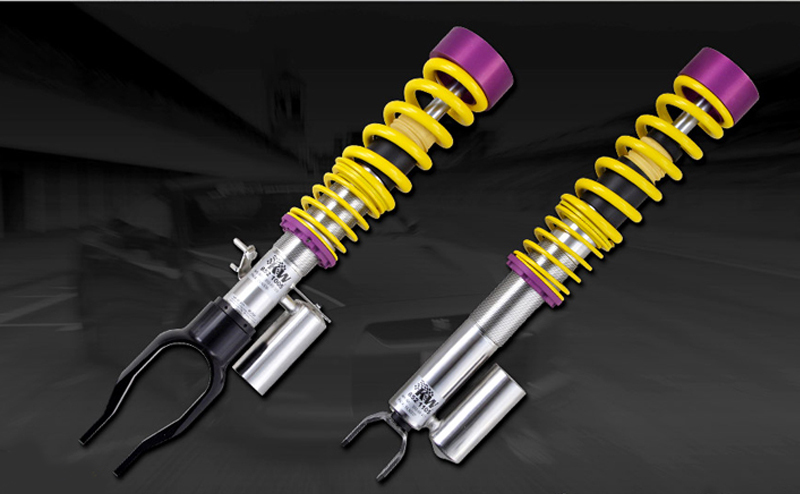 Coilover characteristics consist of increased spring rates, different valving, larger diameter piston rods and racing top mounts. With these features enthusiasts will have a better product for track day motorsport events.